Josh Heupel may be in the midst of his first season as UCF head football coach, but his coaching career can be traced back as early as age 5. “Little Heup” — pronounced Hype — as he was known then, began changing out the cleats in the equipment room at Northern State University’s football offices in Aberdeen, South Dakota, where his father, Ken Heupel, served as head coach. He ate at team meals and sat in on film sessions. “I just thought it was the coolest experience that you could have as a kid,” says Heupel, who now brings his children, Hannah, 10, and Jace, 8, to the office with him on occasion. 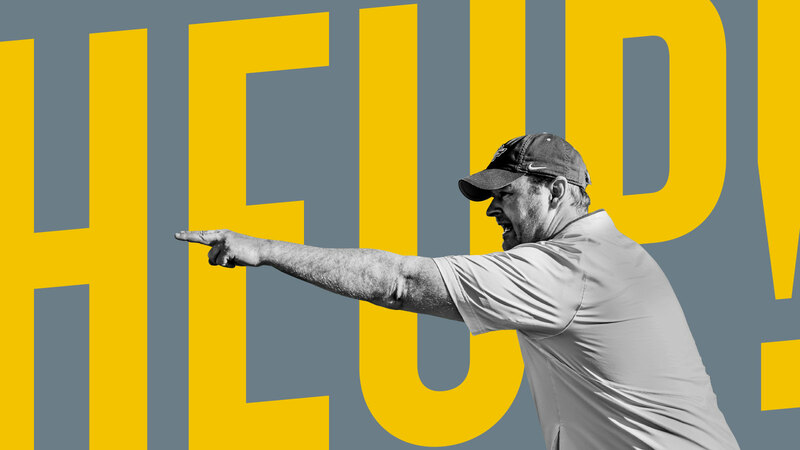 A former Heisman Trophy runner-up and national champion at the University of Oklahoma, Heupel has never lost his excitement for the sport that allows him to impact the lives of others. How do you make a program better every day? We emphasize accountability, trust and attacking; and attacking is just another word for working extremely hard. Those three values are how we are going to interact in every area of our life. We talk about being great with your faith, being great with your family, and being great academically, socially and athletically. If you carry those values into those different areas and try to achieve greatness in all of them, you are putting yourself in a position to be successful for your entire life. What is the key to motivating today’s student-athletes? Communication, more than anything, is different with this generation. That doesn’t apply just to players; it’s my son and my daughter, too. Technology has dramatically changed the world. The amount of information everyone has access to has changed their perspective and understanding. So for us as coaches, when we’re dealing with our players, the thing we always have to answer to me is ‘the why’ — why are we asking you to do something? If you answer the why, and players understand there’s a purpose behind something, they’re going to buy in. I pound coffee. I drink it by the gallon — straight, black. I’m way more productive in the morning than I am late at night. What’s playing over your speakers? When I drive into the office, I’m listening to Christian contemporary, probably. Sturgill Simpson for country. My kids really like Imagine Dragons, so I’ll listen to that, and I get into Mumford & Sons and that genre. During football season, it goes in a different direction. We’ll do some old-school rap in the offices. Biggie Smalls is a personal favorite of mine. We call Mondays “Outkast Monday” while we are putting our game plan together. Your mom was your high school principal. Were you ever called into her office? Only for good things. That’s what I’m going to say in this magazine article anyway. If I ever did get in trouble, which was maybe once, I tried to get to the assistant principal and not walk into my mom’s office. As far as leadership style goes, my dad gets a lot of play because he’s in coaching and I spent a lot of time around him, but I’ve tried to take a lot of communication skills from my mom and learn from how she interacted with others as a leader. At one time, I was involved in hockey, basketball and wrestling all at the same time. My mom was getting tired of it and said, “You’re going to quit one of them, and it’s going to be hockey.” And that was because of the outdoor practices. We only had one indoor rink, and you only got it once a week. How do you prepare for fans’ expectations going into this season? I love their expectations, but I don’t really pay attention to them. At the end of the day, none of their expectations are going to be any higher than I have for our football team and for myself. We focus on our daily purpose and our daily actions, and we’re going to go into every Saturday understanding that we have an opportunity to win. As big as our university is with the number of students that we have, it still feels like a true community. It’s not overwhelming for our student-athletes or our recruits when they come to campus. I think that’s a unique quality, and it’s a lot of fun when a university feels that way. I love that we’re situated right in Orlando. When I want to get out with my wife and kids, you have everything here you can imagine within a 30-minute drive. At the same time, you go out to the other side of campus, and you have the opportunity to go hunt, fish and be out in nature. The uniqueness of this university in this city is that within an hour, you are everywhere you want to be.